It is one of the iconic images of the 20th century: President Richard Nixon steps off a plane in Beijing and shakes hands with China’s Prime Minister Zhou Enlai in 1972, ending decades of hostility and signaling the beginning of a U.S. rapprochement with China. But less known is the role that Jerome A. Cohen, a China law scholar, played in this diplomatic coup. Nixon’s trip, of course, not only marked the opening of U.S.-China relations, it also set China on a path to becoming a world economic power. And as China ascended, so did Cohen’s legal career; his specialty—Chinese legal studies—went from an obscure, backwater academic discipline to a high-profile, high-stakes area of expertise. By any standard, his career has been remarkably productive and influential: Through his 17 years at Harvard Law, where he founded the nation’s first East Asia legal studies program, his nearly two decades as a deal-making partner at Paul, Weiss, Rifkind, Wharton & Garrison, and his most recent years at NYU Law, which he joined in 1990, Cohen, 79, has had a significant impact on legal affairs in East Asia, particularly in China. As a human rights advocate, he has helped secure the release of several political prisoners in the region, such as Annette Lu, who would become a vice president of Taiwan, and Kim Dae-jung, who would serve as president of South Korea and win the Nobel Peace Prize. As an attorney practicing international business law, he achieved several firsts, including becoming the first Western lawyer to practice in Beijing under communist rule. 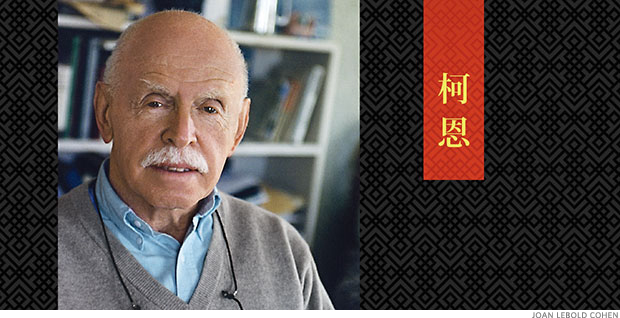 Known as the “Godfather” of Chinese legal studies because he was a pioneer in the field and a mentor to so many, Cohen has taught and inspired literally hundreds, many of them now leading scholars and policy makers, including William Alford, director of East Asian Legal Studies at Harvard, Ma Ying-jeou (LL.M. ’76), Taiwan’s president, and Clark Randt Jr., the recent U.S. ambassador to China, all of whom Cohen taught at Harvard. With his full moustache, propensity for bow ties, and friendly, can-do demeanor, Cohen has always stood out in China. But due to his ability to read people and connect, regardless of their age, social status, or nationality, he has managed to bridge the cultural divide and broker solutions. Everyone who knows Cohen remarks upon his graciousness and generosity, his consistent willingness to make introductions or give advice to people in the field. “He is such a prince,” says Sharon Hom ’80, executive director of Human Rights in China, who recalls how Cohen spent hours vetting the organization’s draft report on China’s opaque state-secrets system. “Jerry always has time for people, not just famous people,” says Ira Belkin ’82, who runs the Ford Foundation’s Law and Rights program in China and still remembers attending an NYU Law event in Shanghai years ago and being impressed at how Cohen had a personal relationship with every student. Indeed, this knack for cultivating relationships, whether with Chinese bureaucrats, American politicians, human rights activists, or young law students, is a key factor in his influence. Cohen always uses his relationship-building skills in service of his higher goal: pushing for a genuine rule of law in China. Cohen has consistently supported China’s international ambitions, advocating for normalization of relations in the 1970s, negotiating Chinese joint ventures for multinationals through the 1980s and 1990s, and pushing for China’s admission to the World Trade Organization in 2001, because he believes that through international contacts, contracts, and cooperation, China will gradually adopt and follow the rule of law. But Cohen also has been willing to point out when China falls short—and in recent years has adroitly used the media to put pressure on the government. Whether pointing out corruption in China’s international arbitration body, as he did in 2005, or campaigning day-in, day-out for the protection of Chinese defense lawyers from government harassment and imprisonment, Cohen has often named names, publicly challenging the responsible government officials to do the right thing. After stints as an associate at Covington & Burling, as an assistant U.S. attorney for the District of Columbia, and as a consultant to the U.S. Senate Committee on Foreign Relations, Cohen had the résumé, smarts, and connections for the kind of political career that would have made his parents proud. But he chose to teach law at the University of California, Berkeley. “I always wanted to be able to speak freely, and academic tenure provided that,” he said. His wife, Joan, who had a B.A. in art history from Smith College and was then an at-home mom of two (with a third son to be born in 1961), says she gave Cohen her blessing but told him, “You’re picking the one field where no firm would ever want to consult you.” Many of Cohen’s friends and colleagues “thought I must be having a nervous breakdown,” says Cohen, noting China was then completely closed off from the West. His old mentor Justice Frankfurter even wrote Cohen, warning him that he was “throwing away” all his hard-earned knowledge of U.S. law. Cohen’s faith—in himself, his new vocation—was not shaken, and in fact, as was his nature, he seemed to gain strength in the face of opposition. After getting over Frankfurter’s barb, Cohen wrote him a note saying he understood Frankfurter’s reaction because the retiring Berkeley dean—whom Frankfurter disliked intensely—had told Cohen the same thing. Frankfurter, Cohen says, then dashed off a handwritten letter: “Given the role China is destined to play in your lifetime and that of your children, you tell him to go to hell!” It was vintage Cohen: With his good-natured sense of humor and astute insight into people, he’d gotten exactly the response he’d wanted—and proven a point. By 1963, Cohen, near-fluent in Mandarin, was on sabbatical in Hong Kong, interviewing refugees from mainland China about legal procedures used in criminal cases. The result was his first book, The Criminal Process in the People’s Republic of China, 1949-1963, widely praised for detailing criminal procedure in China and analyzing its connection to Confucian and imperial Chinese traditions and social norms and practices. In 1964, he joined Harvard Law School and moved to Cambridge. Like many Asia scholars in the 1960s, Cohen lectured, gave interviews, and wrote articles opposing the reflexive anticommunism of the time. But unlike many of his fellow academics, Cohen also had a gift for negotiation and saw an opening to broker a solution to a notorious Cold War case that had been a sore point in U.S.-China relations. In 1952, a Yale classmate of Cohen’s, John Downey, along with another American, Richard Fecteau, had been captured and imprisoned by the Chinese government. China had insisted that Downey and Fecteau were CIA agents on a secret mission to foment rebellion in China. The U.S. denied the charge, claiming they were Army civilian employees whose flight went off course from South Korea. But Cohen remembered attending a CIA recruiting session at Yale in early 1951, where a CIA recruiter spoke vaguely of a possible mission in China. Cohen decided not to sign up, but it was known that a few students, including Downey, did. At a Yale reunion, Cohen’s classmates asked Cohen to work on Downey’s release from prison. In summer 1971, Cohen appeared before the Senate Foreign Relations Committee and wrote a New York Times op-ed, revealing what he knew about the Downey and Fecteau case and urging the U.S. government to come clean. (During that spring, he’d also floated this idea to Kissinger and Huang Hua, then China’s ambassador to Canada.) “I knew how much China resented the hypocrisy of the U.S.,” says Cohen. “I thought if I could get the U.S. to finally tell the truth, that would satisfy China and they’d release” Downey and Fecteau. In December 1971, Fecteau was released. Downey was released in March 1973, six weeks after Nixon, for the first time, publicly admitted Downey’s CIA affiliation. Although it is known that Kissinger discussed the Downey case during his secret talks with the Chinese during the summer of 1971, the extent of Cohen’s influence is unclear. Kissinger didn’t even acknowledge the existence of Cohen’s 1968 memorandum on China until the 1979 publication of his White House memoir. Even then, he downplayed the memo’s importance, suggesting that the China scholars didn’t understand all of the geopolitical subtleties. But for Cohen, getting credit was never as important as getting access: What he most wanted then was to finally visit China and learn the inner workings of the legal system he’d been studying from afar. In May 1972, Cohen made his first visit to China, as part of a small delegation of the Federation of American Scientists. It was thrilling. “So few Americans were allowed to visit that Zhou Enlai personally approved each visa that year,” he says. Cohen and a few others had a four-hour dinner with Zhou, in which they discussed the possibility of academic exchanges. But Cohen knew that legal exchanges wouldn’t be imminent. Upon his return, he wrote in an essay, “The first thing to learn about legal education in China is that there isn’t any.” Their constitution, he noted, was mostly “an unenforceable collection of political slogans and principles.” Bookstores had no legal section. There were no law professors to meet—since the Cultural Revolution, they’d been sent to work on farms or shuttered at home. While few China experts have met both Deng and Zhou, as Cohen has, what established Cohen as a China insider were the years he spent as a deal-making attorney in the country. “I don’t hang around with the Chinese leadership. They think I am not a person who is entirely reliable,” Cohen says, explaining he never tried to cultivate relationships with the top leaders, fearing it might hamstring his ability to speak freely. When Cohen tells the story of how he became the first Western lawyer to practice in Beijing, he notes he happened to be in Hong Kong on a sabbatical in January 1979, with a sideline consulting at Coudert Brothers, a New York law firm trying to expand its presence in Asia. Deng had just announced a raft of economic and legal reforms that were opening China to foreign trade and investment, and Cohen’s phone began ringing off the hook from Fortune 500 companies interested in setting up joint ventures in China. Some of these calls, however, came as a direct result of Cohen’s gift for building relationships. A former Chinese tutor of his at Harvard, for instance, put him in touch with Xiao Yang, who headed the Beijing Economic Commission. Xiao and Cohen worked out a deal: In exchange for teaching 30 of Xiao’s commerce officials basic contract and business law a few hours a week, Cohen would receive permission to live and practice in Beijing, something no Western lawyer had done since the People’s Republic of China was established in 1949. Even Cohen’s first major client, General Motors, which wanted to open up a $1 billion heavy-truck manufacturing plant in China, came to him through an acquaintance he’d made. Bob Rothman, a GM attorney, had heard Cohen lecture at the University of Michigan while an undergraduate majoring in Chinese in the late 1960s. He then wrote Cohen for career advice. Cohen wrote back, advising him to apply to law school and sending him several publications to help Rothman with a paper he was writing about Chinese marriage law. Rothman never forgot it. “I was so impressed that he’d bent over backwards for some kid he didn’t know,” says Rothman. Though the company never got further than a memorandum of understanding on that plant, GM retained Cohen as an adviser off and on for nearly a decade. Living at the Beijing Hotel, Joan and Jerome found themselves under constant surveillance. Their office and home phones were tapped, their rooms bugged. Visitors to their hotel suite were often interrogated on the way in—and on the way out. The couple, however, made a decision not to be intimidated. “We knew that at any point, we could be asked to leave. We wouldn’t know why or when it might occur, so we just went on with our lives,” says Joan. Spending much of the year in Hong Kong (with a small apartment in New York and a summer house in Cape Cod), Cohen devoted the next few years to making deals and matching wits with Chinese officials, many of them party functionaries with no legal experience. “At first, I would go to meetings and people would just stare at us, blank faced. They’d never seen a Westerner before. They didn’t know if they could trust us,” he says. He learned that it helped if he could explain his positions using “a few old ideological maxims,” such as Deng’s saying, “Speak truth to facts.” He also found that if he could “say that it was good for foreign investment, and say it with a straight face,” his suggestions would often be adopted. “Often these slogans were useful tools, especially when dealing with people who weren’t lawyers but were guided by [Communist Party] clichés,” he says. On June 4, 1989, China’s army crushed the student protest movement centered in Tiananmen Square, and deal-making ground to a halt. Paul, Weiss closed its Hong Kong office. Drawn to the NYU School of Law’s growing global emphasis, Cohen joined the faculty in 1990, while staying engaged at Paul, Weiss until his 2000 retirement. At NYU Law, he worked to build up the school’s Asia legal studies program, recruiting Frank Upham, a former student and an expert in Japanese law, as well as bringing over numerous visiting scholars and professors from East Asia. One of Cohen’s signature courses became Legal Problems of Doing Business with China and East Asia; drawing on Cohen’s unique experiences, the course also has included his frontline view of how Chinese business disputes can turn ugly. After China established capital markets in the early 1990s, the Chinese had more opportunities to accumulate wealth, but Cohen says the system of guanxi—“connections,” or the old boys’ network— often meant that local authorities would sometimes collude with, or against, Chinese business executives embroiled in disputes. In the mid-1990s, an American investment firm brought Cohen in as a legal adviser after a Chinese executive involved in its joint venture was kidnapped and illegally detained by local authorities; Cohen says the officials were looking to prove corruption charges leveled by jealous ex-employees. Cohen met with local prosecutors and went over with them “line by line” China’s then-recently amended criminal procedure law, including the provision allowing the right to counsel. “The prosecutor looked at me and said, ‘Our job is to get corrupt people! We don’t have to pay any attention to this procedure!’” says Cohen, who then appealed to the national prosecutors’ office to investigate—to no avail. The local authorities typically have the last word in such disputes. For despite Americans’ impression that China’s leadership rules from Beijing with an iron fist, Cohen says the provinces and local governmental institutions often function as quasi-independent “feudal baronies,” in part because of the system of local protectionism. As a result of such cases, since 1999, Cohen has focused on reform of the criminal justice system—what he calls the “weakest link” in China’s legal system. Even when Chinese officials do follow the existing rules, police still are permitted by law to detain suspects without approval of an outside agency, and suspects have no right to silence. Vaguely worded criminal laws against “endangering state security” and “inciting subversion” enable the regime to impose harsh sentences whenever it desires. Amnesty International, in fact, calls China the world’s “top executioner,” estimating some 1,700 death penalty executions, though probably many more, each year. China classifies the exact number as a state secret. Working pro bono for Song’s wife and Dickinson College, Cohen arranged for a Chinese lawyer to represent Song. Then, he masterminded a public relations campaign, enlisting the support of Senator Arlen Specter, as well as launching a petition calling for Song’s release, which garnered 176 signatures from China scholars around the world. Less than a month after Cohen joined the case, Song was released in January 2001. “If you see Jerry, please tell him, ‘Thank you, again,’” says Song, now a research librarian at California State University in Los Angeles. More recently, though, China has been less willing to bend. Since 2005, Cohen has crusaded for the release of Chen Guangcheng, a blind human rights defender placed under house arrest and then imprisoned after filing a lawsuit on behalf of thousands of Chinese women who underwent forced abortions and sterilizations. In 2003, Cohen met Chen, known as a “barefoot lawyer” because he is selftaught in the law and provides free legal counsel to peasants, and Cohen became an ardent champion of his work. After meeting Chen through Cohen, Chenguang Wang, Tsinghua Law School’s former dean, says he instituted a program for Tsinghua law students to spend their summers training other “barefoot lawyers” in rural communities in China. But in 2005, Chen was placed under house arrest; the next year, he was tried and convicted of trumped-up charges—property destruction and “interfering with public order”—and sentenced to four years in prison. Cohen has been writing and speaking out about the case ever since, even in China. Such retribution has been rare, and if he is worried about losing the right to travel, teach, and speak in China, he isn’t showing it. The Law School’s U.S.-Asia Law Institute, established in 2006 by Cohen and Upham, continues to promote legal reform. With the help of senior research fellows Margaret Lewis ’03 and Daniel Ping Yu, as well as others, the institute has brought over Chinese judges, lawyers, prosecutors, and academics to study such hot-button issues as procedural safeguards in death penalty appeals. Writing a twice-monthly column for the Hong Kong–based South China Morning Post, Cohen also keeps the spotlight on legal abuses, such as the case of Gao Zhisheng, a missing Chinese human rights lawyer who was last seen in the custody of State Security agents in February. —Pamela Kruger is a New Jersey-based writer and editor.